Some order decorations are pretty common. Looking at the Kingdom of Prussia, one will see rather quickly, that there were uncountable numbers of the Order of the Crown awarded. 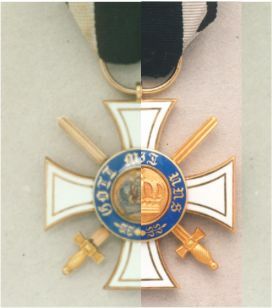 Since orders were given for long service, there were certain officials that couldn't get around being awarded a certain type and class of order. Especially the Order of the Crown seems to be used for those purposes. 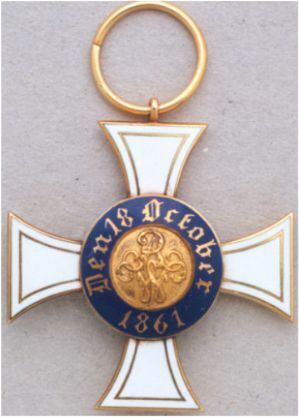 Everyone collecting Imperial German orders will have a number of these order decoration in his collection, on a medal bar or as a single piece. After reading the first paragraph one would say, "Not a very interesting piece". However looking deeper into this topic will bring variations to the surfaces that are everything than common. 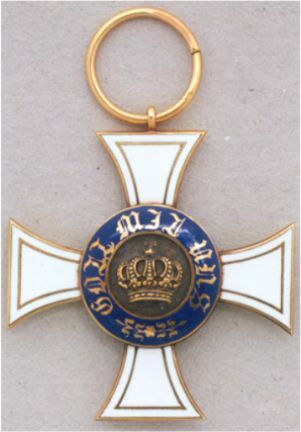 Swords for example were given infrequently, the Red Cross decorations for 1870/71, the cross attachment for the members of the order of St. John and the long service or jubilee numbers. Definitely rare are all decorations of the first model, awarded in the form with the small crown until approx. 1864. What is the difference between the first and the second type one will ask, to make sure he acquires the right piece for his collection. As easy as that: The small crown. As easy as that? No. Other details may be easily overlooked. The cross body follows the "handwriting" of the jeweler who made a particular decoration. This means that the Wagner made piece from before 1864 looks exactly like the cross body made by Wagner after 1864 - hollow made, scratch mark "W" on the lower cross arm. The definitive clue is the medallion. The smaller crown in the first model, of course, is very different in design than the crown of the second model. A very high relief and somewhat three-dimensional design was used. 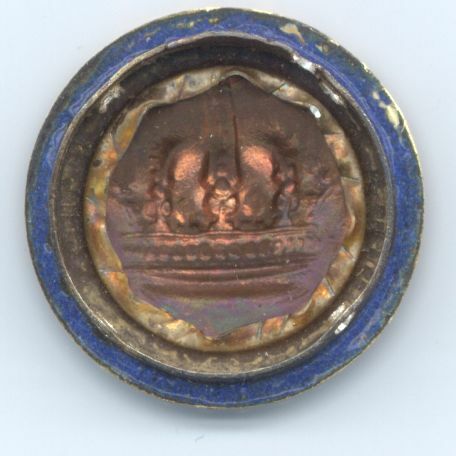 The background of the first model medallion is finer pebbled than its successor - very fine struck. 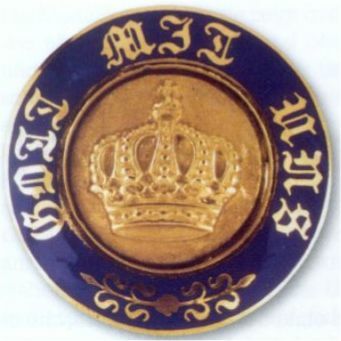 Furthermore the medallion center plate showing the crown is smaller than that of the second model. The second and important difference is that the medallion's wreath is broader and is dark blue enameled. 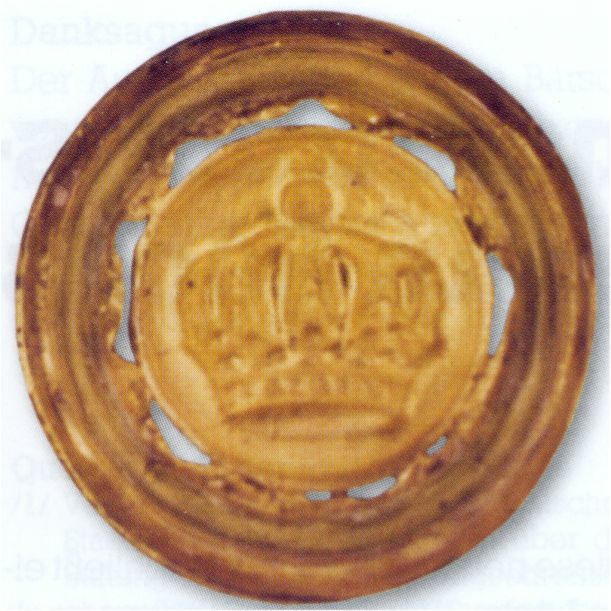 According to my article about electroplating I would like to introduce the reader to a modern fake that I obtained several years ago - a 2nd Class badge of the first model of the Prussian Order of The Crown. I will just focus onto the detail, which made me aware of the fact, that I had bought this fake. Looking at medallions pictured below, one will see that the pictured center isn't as fine struck, as it should be. The medallion wreath also seems to be the one that should be from a second model, it is the smaller and light blue enameled. My first thought was that perhaps the piece was restored between 1900 and 1864 using a contemporary medallion circle (Second model). However I wondered about the bad quality of the center plate. I took the piece apart. This was easy because orders are fixed together using a resin that melts at lower temperature. Taking this piece apart, made the answer clear. The Piece was completely assembled. A cross body and nice but not good enough made front and back center plates. These don't really fit into that larger diameter medallion ring. The close up picture shows in detail the gap on the medallion plates. Original plates were fixed into the order in the way, which is shown in the picture below. The center rim was bent to the middle and attached from the back. This enabled the jeweler to fit the center plate like a spring-ring into the center and used less material. The modern copier didn't have to care about this, since the material is cheaper these days than in the 19th century, were the material was more worthy that the labor someone would put into assembling an order like this. Needless to say, that none would have done such a sloppy job on an order that had to pass the control of the Orders Chancellery and the jeweler master himself. Let me say this again, there is nothing more important than knowing about the way material was worked on to make those wonderful order decorations we all collect today.